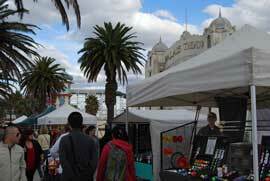 If you want a free cool day trip outside of Melbourne city centre then St Kilda is the place to go. I’ve made two routes here, one if you have youngish kids and another for everyone else. ........And this ticket also allows you to travel on the Melbourne metro system all day long without paying any extra money – not that you’ll have time to visit anywhere else though! ........This market has been going since the 1970’s and there are nearly 200 artist and craft stalls to look at with a big variety of things to check out. .........Get off at The Esplanade and you’ll see the market right in front of you. It opens at 10am. 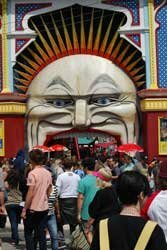 ........It’s the entrance area that’s famous though and you’ll have seen this on postcards and brochures about Melbourne. Make sure you get a photo! ........If it’s windy you’ll see loads of kitesurfers. I could spend hours watching them trying their jumping tricks. I tried learning kitesurfing once but only succeeded being pulled head first along the water which wasn’t much fun! People-watching round here is good too as there’s such a variety of people around and there’s always things happening to watch. You could walk for miles along the seafront in either direction as the walk goes from the West Gate Bridge down to Frankston – but there isn’t time today!! If it’s summer obviously a dip in the water will be nice too. 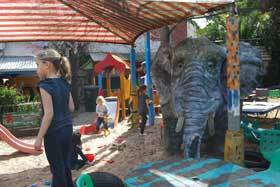 .........See my page about the St Kilda Adventure Playground here. .........so make sure you don't miss it! ........It'll tell you the website address where you can download the podcast to take along, (this is the best method), or you can listen to the story online and take some notes to bring with you. ..........It’s at 26 Acland Street and is a free council owned contemporary art gallery which is usually well worth a look around. 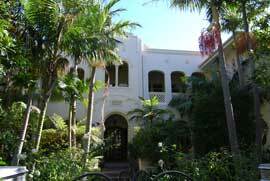 It’s housed in a gorgeous old mansion built between 1855 and 1885. ........If not, go and have a look at the cakes in the windows anyway. You’ll see that this street is usually heaving with people. ......It’s a wonderful finish to this Cool Day Trip and all for free - as long as you didn't buy those cakes! ...........and this second map is for everybody else!